Your gum line can start receding at any stage of your life, especially in middle aged. However, during times of hormonal imbalance, such as menopause, women are particularly susceptible to gum recession. Fortunately, there are things you can do to halt or prevent this process. The best way to start is to find out how hormonal imbalance impacts your gum line. Aging teeth can be a huge contributing factor for receding gum lines. As your teeth age, they become more affected by general wear and tear, leading to natural deterioration of the gingival tissue surrounding the teeth. This combination of factors leaves gums more susceptible to receding, meaning it's more common during menopause than other stages of life when hormone levels may fluctuate, such as puberty. 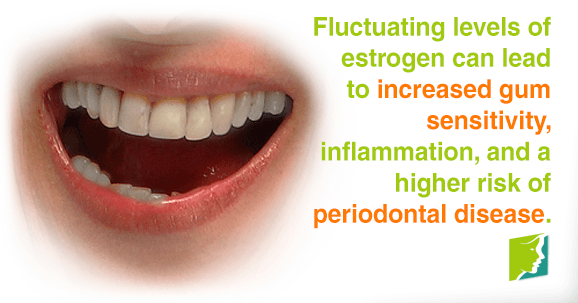 Although researchers are still studying the connection between estrogen levels and oral health in general, like the onset of receding gum lines, the correlation between them is well documented. Fluctuating levels of estrogen lead to changes in gum sensitivity, inflammation, and can mean a higher risk of periodontal disease. Low levels of estrogen can also affect the health of the bones in general, which can have a double effect on oral health and receding gum lines. It can weaken the jawbones and teeth, putting more stress on the gums. Making sure you consume enough calcium and vitamin D can help prevent jawbone erosion, but these nutrients are not sufficient to restore bone loss; for that, you need to rebalance hormone levels as well. Hormonal changes during menopause can result in a variety of periodontal symptoms. Some women may experience heightened gum sensitivity, which can manifest as tenderness, pain, or irritation. Gum sensitivity can increase the chance of developing a receding gum line and result in gum infections or bleeding gums. Since estrogen also plays a role in regulating the immune system, a decrease in levels can impact the immune system's ability to fight oral bacteria. One of the less discussed symptoms of menopause is receding gum lines. Although a number of factors can cause gum lines to recede, estrogen imbalance can be a major cause during menopause. The best way to tackle this problem is to learn about the hormonal impact on the health of your teeth and gums. Tooth and gum pain can be extremely frustrating, and the best way to manage gum problems is to prevent them from occurring in the first place.